The association between the Canadian Crown and Indigenous peoples of Canada stretches back to the first decisions between North American Indigenous peoples and European colonialists and, over centuries of interface, treaties were established concerning the monarch and Indigenous tribes. Canada's First Nations, Inuit, and Métis peoples now have a unique relationship with the reigning monarch and, like the Māori and the Treaty of Waitangi in New Zealand, generally view the affiliation as being not between them and the ever-changing Cabinet, but instead with the continuous Crown of Canada, as embodied in the reigning sovereign. These agreements with the Crown are administered by Canadian Aboriginal law and overseen by the Minister of Indigenous and Northern Affairs. The association between Canada's Indigenous peoples and the Canadian Crown is both statutory and traditional, the treaties being seen by the first peoples both as legal contracts and as perpetual and personal promises by successive reigning kings and queens to protect Aboriginal welfare, define their rights, and reconcile their sovereignty with that of the monarch in Canada. The agreements are formed with the Crown because the monarchy is thought to have inherent stability and continuity, as opposed to the transitory nature of populist whims that rule the political government, meaning the link between monarch and Aboriginals will theoretically last for "as long as the sun shines, grass grows and rivers flow." The Office that I hold represents the Canadian Crown. As we are all aware the Crown has a fiduciary responsibility for the ongoing well being of Canada's First Citizens. While treaties were signed between European monarchs and First Nations in North America as far back as 1676, the only ones that survived the American Revolution are those in Canada, which date to the beginning of the 18th century. Today, the main guide for relations between the monarchy and Canadian First Nations is King George III's Royal Proclamation of 1763; while not a treaty, it is regarded by First Nations as their Magna Carta or "Indian Bill of Rights", binding on not only the British Crown but the Canadian one as well, as the document remains a part of the Canadian constitution. The proclamation set parts of the King's North American realm aside for colonists and reserved others for the First Nations, thereby affirming native title to their lands and making clear that, though under the sovereignty of the Crown, the Aboriginal bands were autonomous political units in a "nation-to-nation" association with non-native governments, with the monarch as the intermediary. This created not only a "constitutional and moral basis of alliance" between indigenous Canadians and the Canadian state as personified in the monarch, but also a fiduciary affiliation in which the Crown is constitutionally charged with providing certain guarantees to the First Nations, as affirmed in Sparrow v. The Queen, meaning that the "honour of the Crown" is at stake in dealings between it and First Nations leaders. This stone was taken from the grounds of Balmoral Castle in the Highlands of Scotland—a place dear to my great-great-grandmother, Queen Victoria. It symbolises the foundation of the rights of First Nations peoples reflected in treaties signed with the Crown during her reign. Bearing the cypher of Queen Victoria as well as my own, this stone is presented to the First Nations University of Canada in the hope that it will serve as a reminder of the special relationship between the sovereign and all First Nations peoples. From time to time, the link between the Crown and Aboriginal peoples will be symbolically expressed, through pow-wows or other types of ceremony held to mark the anniversary of a particular treaty — sometimes with the participation of the monarch, another member of the Canadian Royal Family, or one of the Sovereign's representatives[n 5]—or simply an occasion mounted to coincide with the presence of a member of the Royal Family on a royal tour, Aboriginals having always been a part of such tours of Canada. Gifts have been frequently exchanged[n 6] and Aboriginal titles have been bestowed upon royal and viceregal figures since the early days of indigenous contact with the Crown: The Ojibwa referred to King George III as the Great Father and Queen Victoria was later dubbed as the Great White Mother. Queen Elizabeth II was named Mother of all People by the Salish nation in 1959 and her son, Prince Charles, was in 1976 given by the Inuit the title of Attaniout Ikeneego, meaning Son of the Big Boss. Charles was further honoured in 1986, when Cree and Ojibwa students in Winnipeg named Charles Leading Star, and again in 2001, during the Prince's first visit to Saskatchewan, when he was named Pisimwa Kamiwohkitahpamikohk, or The Sun Looks at Him in a Good Way, by an elder in a ceremony at Wanuskewin Heritage Park. Explorers commissioned by French and English monarchs made contact with North American Aboriginals in the late 15th and early 16th centuries. These interactions were generally peaceful—the agents of each sovereign seeking the Indians' alliance in wresting territories away from the other monarch—and the partnerships were typically secured through treaties, the first signed in 1676. However, the English also used friendly gestures as a vehicle for establishing Crown dealings with Aboriginal inhabitants, while simultaneously expanding their domain: as fur traders and outposts of the Hudson's Bay Company (HBC), a crown corporation founded in 1670, spread westward across the continent, they introduced the concept of a just, paternal monarch to "guide and animate their exertions," to inspire loyalty, and promote peaceful relations. During the fur trade, before the British crown was considering permanent settlement, marital alliances between traders and Indigenous women were a form of alliance between indigenous tribes and the crown. When settlement was being planned by the crown, treaties become the more official and permanent form of relations. They also brought with them images of the English monarch, such as the medal that bore the effigy of King Charles II (founder of the HBC) and which was presented to native chiefs as a mark of distinction; these medallions were passed down through the generations of the chiefs' descendants and those who wore them received particular honour and recognition at HBC posts. The Great Peace of Montreal was in 1701 signed by the Governor of New France, representing King Louis XIV, and the chiefs of 39 First Nations. Then, in 1710, Aboriginal leaders were visiting personally with the British monarch; in that year, Queen Anne held audience at St. James' Palace with three Mohawk—Sa Ga Yeath Qua Pieth Tow of the Bear Clan (called Peter Brant, King of Maguas), Ho Nee Yeath Taw No Row of the Wolf Clan (called King John of Canojaharie), and Tee Yee Ho Ga Row, or "Double Life", of the Wolf Clan (called King Hendrick Peters)—and one Mahicanin Chief—Etow Oh Koam of the Turtle Clan (called Emperor of the Six Nations). The four, dubbed the Four Mohawk Kings, were received in London as diplomats, being transported through the streets in royal carriages and visiting the Tower of London and St. Paul's Cathedral. But, their business was to request military aid for defence against the French, as well as missionaries for spiritual guidance. The latter request was passed by Anne to the Archbishop of Canterbury, Thomas Tenison, and a chapel was eventually built in 1711 at Fort Hunter, near present day Johnstown, New York, along with the gift of a reed organ and a set of silver chalices in 1712. 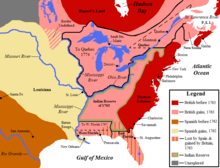 Both British and French monarchs viewed their lands in North America as being held by them in totality, including those occupied by First Nations. Typically, the treaties established delineations between territory reserved for colonial settlement and that distinctly for Aboriginal use. The French kings, though they did not admit claims by Aboriginals to lands in New France, granted the natives reserves for their exclusive use; for instance, from 1716 onwards, land north and west of the manorials on the Saint Lawrence River were designated as the pays d'enhaut (upper country), or "Indian country", and were forbidden to settlement and clearing of land without the expressed authorisation of the King. The same was done by the kings of Great Britain; for example, the Treaty of 1725, establishing a relationship between King George III and the "Maeganumbe ... tribes Inhabiting His Majesty's Territories," acknowledged the King's title to the provinces of Nova Scotia and Acadia in exchange for the guarantee that the indigenous people "not be molested in their persons ... by His Majesty's subjects." The colonization of land, people, culture and bodies was a result of settler actions in the process of resource extraction and the settlement of the land. An example of this colonization is the imposing of European femininity onto indigenous women of Canada. By imposing Christian ideas of ideal womanhood onto indigenous women colonizers successfully changed the social status of indigenous women. Colonialism was an arm of the crown and its history still influences the Canadian government's policies for indigenous people. The Indian act exclusion of women from maintaining their own status for example, was a government enforced policy that was amended in 1985 with Bill C31. The sovereigns also sought alliances with the First Nations; the Iroquois siding with Georges II and III and the Algonquin with Louis XIV and XV. These arrangements left questions about the treatment of Aboriginals in the French territories once the latter were ceded in 1760 to George III. Article 40 of the Capitulation of Montreal, signed on 8 September 1760, inferred that First Nations peoples who had been subjects of King Louis XV would then become the same of King George: "The Savages or Indian allies of his most Christian Majesty, shall be maintained in the Lands they inhabit; if they chose to remain there; they shall not be molested on any pretence whatsoever, for having carried arms, and served his most Christian Majesty; they shall have, as well as the French, liberty of religion, and shall keep their missionaries ..." Yet, two days before, the Algonquin, along with the Hurons of Lorette and eight other tribes, had already ratified a treaty at Fort Lévis, making them allied with, and subjects of, the British king, who instructed General the Lord Amherst to treat the First Nations "upon the same principals of humanity and proper indulgence" as the French, and to "cultivate the best possible harmony and Friendship with the Chiefs of the Indian Tribes." The retention of civil code in Quebec, though, caused the relations between the Crown and First Nations in that jurisdiction to be viewed as dissimilar to those that existed in the other Canadian colonies. In 1763, George III issued a Royal Proclamation that acknowledged the First Nations as autonomous political units and affirmed their title to their lands; it became the main document governing the parameters of the relationship between the sovereign and his Aboriginal subjects in North America. The King thereafter ordered Sir William Johnson to make the proclamation known to the Aboriginal nations under the King's sovereignty and, by 1766, its provisions were already put into practical use. [n 8] In the prelude to the American Revolution, native leader Joseph Brant took the King up on this offer of protection and voyaged to London between 1775 and 1776 to meet with George III in person and discuss the aggressive expansionist policies of the American colonists. During the course of the American Revolution, First Nations assisted King George III's North American forces, who ultimately lost the conflict. As a result of the Treaty of Paris, signed in 1783 between King George and the American Congress of the Confederation, British North America was divided into the sovereign United States (US) and the still British Canadas, creating a new international border through some of those lands that had been set apart by the Crown for First Nations and completely immersing others within the new republic. As a result, some Aboriginal tribes felt betrayed by the King and their service to the monarch was detailed in oratories that called on the Crown to keep its promises, especially after nations that had allied themselves with the British sovereign were driven from their lands by Americans. New treaties were drafted and those indigenous nations that had lost their territories in the United States, or simply wished to not live under the US government, were granted new land in Canada by the King. The Mohawk Nation was one such group, which abandoned its Mohawk Valley territory, in present day New York State, after Americans destroyed the natives' settlement, including the chapel donated by Queen Anne following the visit to London of the Four Mohawk Kings. As compensation, George III promised land in Canada to the Six Nations and, in 1784, some Mohawks settled in what is now the Bay of Quinte and the Grand River Valley, where North America's only two Chapels Royal—Christ Church Royal Chapel of the Mohawks and Her Majesty's Chapel of the Mohawks—were built to symbolise the connection between the Mohawk people and the Crown. Thereafter, the treaties with Aboriginals across southern Ontario were dubbed the Covenant Chain and ensured the preservation of First Nations' rights not provided elsewhere in the Americas. This treatment encouraged the loyalty of the Aboriginal peoples to the sovereign and, as allies of the King, they aided in defending his North American territories, especially during the War of 1812. In 1860, during one of the first true royal tours of Canada, First Nations put on displays, expressed their loyalty to Queen Victoria, and presented concerns about misconduct on the part of the Indian Department to the Queen's son, Prince Albert Edward, Prince of Wales, when he was in Canada West. In that same year, Nahnebahwequay of the Ojibwa secured an audience with the Queen. When Governor General the Marquess of Lorne and his wife, Princess Louise, a daughter of Queen Victoria, visited British Columbia in 1882, they were greeted upon arrival in New Westminster by a flotilla of local Aboriginals in canoes who sang songs of welcome before the royal couple landed and proceeded through a ceremonial arch built by Aboriginals, which was hung with a banner reading "Clahowya Queenastenass", Chinookian for "Welcome Queen." The following day, the Marquess and Marchioness gave their presence to an event attended by thousands of First Nations people and at least 40 chiefs. One presented the Princess with baskets, a bracelet, and a ring of Aboriginal make and Louise said in response that, when she returned to the United Kingdom, she would show these items to the Queen. Edward, Prince of Wales with two Ojibwe guides canoe on the Nipigon River, in Ontario. Once the Dominion Crown purchased what remained of Rupert's Land from the Hudson's Bay Company and colonial settlement expanded westwards, more treaties were signed between 1871 and 1921, wherein the Crown brokered land exchanges that granted the Aboriginal societies reserves and other compensation, such as livestock, ammunition, education, health care, and certain rights to hunt and fish. The treaties did not ensure peace: as evidenced by the North-West Rebellion of 1885, sparked by Métis people's concerns over their survival and discontent on the part of Cree people over perceived unfairness in the treaties signed with Queen Victoria. Following Canada's legislative independence from the United Kingdom (codified by the Statute of Westminster, 1931) relations—both statutory and ceremonial—between sovereign and First Nations continued unaffected as the British Crown in Canada morphed into a distinctly Canadian monarchy. Indeed, during the 1939 tour of Canada by King George VI and Queen Elizabeth—an event intended to express the new independence of Canada and its monarchy—First Nations journeyed to city centres like Regina, Saskatchewan, and Calgary, Alberta, to meet with the King and present gifts and other displays of loyalty. In the course of the Second World War that followed soon after George's tour, more than 3,000 Aboriginal and Métis Canadians fought for the Canadian Crown and country, some receiving personal recognition from the King, such as Tommy Prince, who was presented with the Military Medal and, on behalf of the President of the United States, the Silver Star by the King at Buckingham Palace. King George's daughter, Elizabeth, acceded to the throne in 1952. Squamish Nation Chief Joe Mathias was amongst the Canadian dignitaries who were invited to attend her coronation in London the following year. In 1959, the Queen toured Canada and, in Labrador, she was greeted by the Chief of the Montagnais and given a pair of beaded moose-hide jackets; at Gaspé, Quebec, she and her husband, the Duke of Edinburgh, were presented with deerskin coats by two local Aboriginal people; and, in Ottawa, a man from the Kahnawake Mohawk Territory passed to officials a 200-year-old wampum as a gift for Elizabeth. It was during that journey that the Queen became the first member of the Royal Family to meet with Inuit representatives, doing so in Stratford, Ontario, and the royal train stopped in Brantford, Ontario, so that the Queen could sign the Six Nations Queen Anne Bible in the presence of Six Nations leaders. Across the prairies, First Nations were present on the welcoming platforms in numerous cities and towns, and at the Calgary Stampede, more than 300 Blackfoot, Tsuu T'ina, and Nakoda performed a war dance and erected approximately 30 teepees, amongst which the Queen and Duke of Edinburgh walked, meeting with various chiefs. 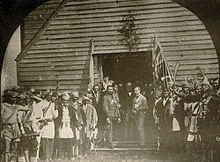 In Nanaimo, British Columbia, a longer meeting took place between Elizabeth and the Salish, wherein the latter conferred on the former the title of Mother of all People and, following a dance of welcome, the Queen and her consort spent 45 minutes (20 more than allotted) touring a replica First Nations village and chatting with some 200 people. In 1970, Elizabeth II's presence at The Pas, Manitoba, provided an opportunity for the Opaskwayak Cree Nation to publicly express their perceptions of injustice meted out by the government. Then, during a royal tour by the Queen in 1973, Harold Cardinal delivered a politically charged speech to the monarch and the Queen responded, stating that "her government recognized the importance of full compliance with the spirit and intent of treaties"; the whole exchange had been pre-arranged between the two. Still, during the same tour, Aboriginal people were not always granted the personal time with the Queen that they desired; the meetings with First Nations and Inuit tended to be purely ceremonial affairs wherein treaty issues were not officially discussed. For instance, when Queen Elizabeth arrived in Stoney Creek, Ontario, five chiefs in full feathered headdress and a cortege of 20 braves and their consorts came to present to her a letter outlining their grievances, but were prevented by officials from meeting with the sovereign. In 1976, the Queen did receive First Nations delegations at Buckingham Palace, such as the group of Alberta Aboriginal Chiefs who, along with Lieutenant Governor of Alberta and Cree chief Ralph Steinhauer, held audience with the monarch there. In the prelude to the patriation of the Canadian constitution in 1982, some First Nations leaders campaigned for and some against the proposed move, many asserting that the federal ministers of the Crown had no right to advise the Queen that she sever, without consent from the First Nations, the treaty rights she and her ancestors had long granted to Aboriginal Canadians. Worrying to them was the fact that their relationship with the monarch had, over the preceding century, come to be interpreted by Indian Affairs officials as one of subordination to the government—a misreading on the part of non-Aboriginals of the terms Great White Mother and her Indian Children. Indeed, First Nations representatives were locked out of constitutional conferences in the late 1970s, leading the National Indian Brotherhood (NIB) to make plans to petition the Queen directly. The Liberal Cabinet at the time, not wishing to be embarrassed by having the monarch intervene, extended to the NIB an invitation to talks at the ministerial level, though not the first ministers' meetings. But the invite came just before the election in May 1979, which put the Progressive Conservative Party into Cabinet and the new ministers of the Crown decided to advise the Queen not to meet with the NIB delegation, while telling the NIB that the Queen had no power. The ministers of the Crown eventually reversed their position and offered a similar invitation to constitutional talks, but the NIB party, consisting of over 200 people, had already departed for London. No meeting with the Queen took place, but the indigenous Canadians' position was confirmed by Master of the Rolls the Lord Denning, who ruled that the relationship was indeed one between sovereign and First Nations directly, clarifying further that, since the Statute of Westminster was passed in 1931, the Canadian Crown had come to be distinct from the British Crown, though the two were still held by the same monarch, leaving the treaties sound. Upon their return to Canada, the NIB was granted access to first ministers' meetings and the ability to address the premiers. Some 15 years later, the Governor General-in-Council, per the Inquiry Act and on the advice of Prime Minister Brian Mulroney, established the Royal Commission on Aboriginal Peoples to address a number of concerns surrounding the relationship between Aboriginal and non-Aboriginal people in Canada. After 178 days of public hearings, visits by 96 communities, and numerous reviews and reports, the central conclusion reached was that "the main policy direction, pursued for more than 150 years, first by colonial then by Canadian governments, has been wrong," focusing on the previous attempts at cultural assimilation. It was recommended that the nation-to-nation relationship of mutual respect be re-established between the Crown and First Nations, specifically calling for the monarch to "announce the establishment of a new era of respect for the treaties" and renew the treaty process through the issuance of a new royal proclamation as supplement to the Royal Proclamation of 1763. It was argued by Tony Hall, a professor of Native American studies at the University of Lethbridge, that the friendly relations between monarch and indigenous Canadians must continue as a means to exercise Canadian sovereignty. In 1994, while the Queen and her then prime minister, Jean Chrétien, were attending an aboriginal cultural festival in Yellowknife, the Dene community of the Northwest Territories presented a list of grievances over stalled land claim negotiations. Similarly, the Queen and Chrétien visited in 1997 the community of Sheshatshiu in Newfoundland and Labrador, where the Innu people of Quebec and Labrador presented a letter of grievance over stagnant land claim talks. On both occasions, instead of giving the documents to the Prime Minister, as he was not party to the treaty agreements, they were handed by the chiefs to the Queen, who, after speaking with the First Nations representatives, then passed the list and letter to Chrétien for him and the other ministers of the Crown to address and advise the Queen or her viceroy on how to proceed. During the visit of Queen Elizabeth II to Alberta and Saskatchewan in 2005, First Nations stated that they felt relegated to a merely ceremonial role, having been denied by federal and provincial ministers any access to the Queen in private audience. First Nations leaders have also raised concerns about what they see as a crumbling relationship between their people and the Crown, fueled by the failure of the federal and provincial cabinets to resolve land claim disputes, as well as a perceived intervention of the Crown into aboriginal affairs. Formal relations have also not yet been founded between the monarchy and a number of First Nations around Canada; such as those in British Columbia who are still engaged in the process of treaty making. Portraits of the Four Mohawk Kings that had been commissioned while the Aboriginal leaders were in London had then hung at Kensington Palace for nearly 270 years, until Queen Elizabeth II in 1977 donated them to the Canadian Collection at the National Archives of Canada, unveiling them personally in Ottawa. That same year, the Queen's son, Prince Charles, Prince of Wales, visited Alberta to attend celebrations marking the 100th anniversary of the signing of Treaty 7, when he was made a Kainai chieftain, and, as a bicentennial gift in 1984, Elizabeth II gave to the Christ Church Royal Chapel of the Mohawks a silver chalice to replace that which was lost from the 1712 Queen Anne set during the American Revolution. In 2003, Elizabeth's other son, Prince Edward, Earl of Wessex, opened the Regina, Saskatchewan, campus of the First Nations University of Canada, where the Queen made her first stop during her 2005 tour of Saskatchewan and Alberta and presented the university with a commemorative granite plaque. A similar scene took place at British Columbia's Government House, when, in 2009, Shawn Atleo, the National Chief of the Assembly of First Nations, presented Prince Charles, Prince of Wales, with a letter of complaint about the Crown's fulfillment of its treaty duties, and requested a meeting with the Queen. Prince Charles then added another dimension to the relationship between the Crown and First Nations when, in a speech in Vancouver, he drew a connection between his own personal interests and concerns in environmentalism and the cultural practices and traditions of Canada's First Nations. In 2010, the Christ Church Royal Chapel was presented sets of handbells from Queen Elizabeth II to symbolise the councils and treaties between the Iroquois Confederacy and the Crown. On 4 July 2010, Queen Elizabeth II presented to Her Majesty's Royal Chapel of the Mohawks and Christ Church Royal Chapel sets of handbells, to symbolise the councils and treaties between the Iroquois Confederacy and the Crown. On the occasion of a visit of Prince Charles to Canada in 2012, the CBC held a round-table discussion between Atleo; John Borrows, a constitutional scholar at the University of Minnesota and an Anishinabe from Ontario; Pamela Palmater, a lawyer and professor at Ryerson University and a Mi'kmaq from New Brunswick; and Taiaiake Alfred, a Mohawk from Kahnawake and a professor at the University of Victoria, asking them to reflect on the relationship between the Crown and First Nations. Alfred stated the Crown's promises to First Nations people were binding on the Canadian state, but Canada had broken all of the promises. Burrows said that the honour of the House of Windsor should demand that Charles guarantee that the treaties be upheld. 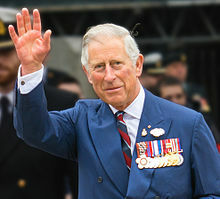 Palmater, speaking of Prince Charles, said: "He is the Crown [sic] and given that it was the Crown who signed treaties and made promises and established the relationship with indigenous nations—he ought to assume some responsibility for making sure Canada carries out those obligations, which the [British] Crown unilaterally devolved to Canada without input from First Nations." During the Idle No More protest movement of 2012–2013, Chief Theresa Spence of the Attawapiskat First Nation mounted a liquids-only hunger strike and demanded a meeting with Prime Minister Stephen Harper, Governor General David Johnston, Atleo, and the chiefs of various regional and tribal councils. She, as well as several of her supporters and sympathizers, wrote to the Queen, asking Elizabeth II to instruct the Governor General to attend, but the Queen declined to do so, indicating that she was bound to follow the advice of her ministers in the federal Cabinet. Spence then indicated that she would boycott a conference involving other First Nations leaders and the Prime Minister because the Governor General, as a non-partisan figure, declined attendance at a policy meeting. The Globe and Mail supported the idea of the governor general playing a role by listening to grievances from Aboriginal leaders as "listener-in-chief", but called it "wrong" to insist that the governor general attend policy discussions and the idea that First Nations people could relate to the Crown and the government "as if they were two separate entities" ... "a fantasy". The Canadian Privy Council Office insisted the meeting not include the governor general to ensure no impression the governor general had the constitutional authority to change government policy. Spence and several other chiefs held a "ceremonial" meeting with the Governor General on 11 January 2013, while the separate working meeting between Harper and other chiefs took place the same day. The report issued at the close of the Truth and Reconciliation Commission in 2015 contained 94 Calls to Action. Among them were requests for students, lawyers, journalists, employees of private businesses, and public servants to be provided education on Aboriginal–Crown relations and for the federal Crown-in-Council "to jointly develop with Aboriginal peoples a Royal Proclamation of Reconciliation to be issued by the Crown [which] would build on the Royal Proclamation of 1763 ... and reaffirm the nation-to-nation relationship between Aboriginal peoples and the Crown." It was desired the proclamation would, in part, "[r]econcile Aboriginal and Crown constitutional and legal orders to ensure that Aboriginal peoples are full partners in Confederation ..."
As the representatives in Canada and the provinces of the reigning monarch, both governors general and lieutenant governors have been closely associated with First Nations, Inuit, and Métis peoples. This dates back to the colonial era, when the sovereign did not travel from Europe to Canada and so dealt with Aboriginal societies through his or her viceroy. After the American Revolution, a tradition was initiated in eastern Canada of appealing to the viceregal representatives for redress of grievances and later, after returning from a cross-country tour in 1901, during which he met with First Nations in the Yukon, Governor General the Earl of Minto urged his ministers to redress the wrongs he had witnessed in the north and to preserve native heritage and folklore. Federal and provincial viceroys also met with First Nations leaders for more ceremonial occasions, such as when in 1867 Canada's first governor general, the Viscount Monck, received a native chief, in full feathers, among some of the first guests at Rideau Hall. 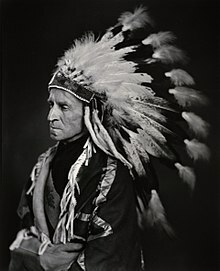 The Marquess of Lansdowne smoked a calumet with Aboriginal people in the Prairies, the Marquess of Lorne was there named Great Brother-in-Law, and the Lord Tweedsmuir was honoured by the Kainai Nation through being made a chief of the Blood Indians and met with Grey Owl in Saskatchewan. The Earl Alexander of Tunis was presented with a totem pole by Kwakiutl carver Mungo Martin, which Alexander erected on the grounds of Rideau Hall, where it stands today with the inukshuk by artist Kananginak Pootoogook that was commissioned in 1997 by Governor General Roméo LeBlanc to commemorate the second National Aboriginal Day. Governor General the Viscount Byng of Vimy undertook a far-reaching tour of the north in 1925, during which he met with First Nations and heard their grievances at Fort Providence and Fort Simpson. Later, Governor General Edward Schreyer was in 1984 made an honorary member of the Kainai Chieftainship, as was one of his viceregal successors, Adrienne Clarkson, who was made such on 23 July 2005, along with being adopted into the Blood Tribe with the name Grandmother of Many Nations. Clarkson was an avid supporter of Canada's north and Inuit culture, employing students from Nunavut Arctic College to assist in designing the Clarkson Cup and creating the Governor General's Northern Medal. Five persons from First Nations have been appointed as the monarch's representative, all in the provincial spheres. Ralph Steinhauer was the first, having been made Lieutenant Governor of Alberta on 2 July 1974; Steinhauer was from the Cree nation. Yvon Dumont was of Métis heritage and served as Lieutenant Governor of Manitoba between 1993 and 1999. The first Lieutenant Governor of Ontario of Aboriginal heritage was James Bartleman, who was appointed to the position on 7 March 2002. A member of the Mnjikaning First Nation, Bartleman listed the encouragement of indigenous young people as one of his key priorities and, during his time in the Queen's service, launched several initiatives to promote literacy and social bridge building, travelling to remote native communities in northern Ontario, pairing native and non-native schools, and creating the Lieutenant Governor's Book Program, which collected 1.4 million books that were flown into the province's north to stock shelves of First Nations community libraries. On 1 October 2007, Steven Point, from the Skowkale First Nation, was installed as Lieutenant Governor of British Columbia and Graydon Nicholas, born on the Tobique Indian Reserve, was made Lieutenant Governor of New Brunswick on 30 September 2009. ^ In a speech given sometime between 1812 and 1817, Chief Peguis of the Ojibwa stated that even King George III, though he was called the Great Father, was below the Great Spirit and could not claim the lands of the spirit as his own. ^ The 1969 White Paper proposed that Aboriginal peoples in Canada be recognised by the Crown in the same fashion as non-native Canadians; a notion that was opposed by Status Indians but later supported by the Reform Party of Canada, which viewed the special treaty rights as racist. ^ For instance, while section VI.91.24 of the Constitution Act, 1867, gives responsibility for "Indians and lands reserved for the Indians" to the monarch in right of Canada, the 1929 Manitoba Natural Resources Transfer Agreement shifted to the monarch in right of Manitoba some of the aforementioned responsibility for setting aside provincial Crown Land to satisfy the sovereign's treaty obligations. ^ The Constitution Act, 1867, gave the Crown in right of Quebec authority over lands and resources within the boundaries of the province, subject to "interest other than that of the province in the same," and it was commonly held that First Nations' title was such an interest. Yet, as early as 1906, federal treaty negotiators were explaining to the Algonquin in Quebec that it was only the Crown in right of Canada that could ratify treaties. Consequently, since Confederation, the Queen of Canada-in-Council has permitted the Lieutenant Governor of Quebec-in-Council to guide settlement and development of Algonquin lands. This arrangement has led to criticism from First Nations leaders of the sovereign's exercise of her duties in Quebec. ^ For instance, in 1999, the Lieutenant Governor of New Brunswick and representatives of the Maliseet First Nation were involved in a ceremony marking the restoration of Old Government House in New Brunswick as a royal and viceregal residence, reflecting the participation of their ancestors in the original dedication ceremony on New Year's Day, 1826. ^ An example being the occasion as when the Squamish people's Capilano Indian Community Club of North Vancouver in 1953 gave the Duke of Edinburgh a walking stick in the form of a totem pole. ^ Innu leader Mary Pia Benuen said in 1997: "The way I see it, she is everybody's queen. It's nice for her to know who the Innu are and why we're fighting for our land claim and self-government all the time." ^ In that year, the Imperial Privy Council endorsed a grant of 20,000 acres (81 km2) to Joseph Marie Philibot at a location of his choosing, but Philibot's request for land on the Restigouche River was denied by the Governor of Quebec on the grounds that "the lands so prayed to be assigned are, or are claimed to be, the property of the Indians and as such by His Majesty's express command as set forth in his proclamation in 1763, not within their power to grant." ^ Treasury Board Secretariat. "Treaty areas". Queen's Printer for Canada. Archived from the original on 22 August 2007. Retrieved 17 November 2009. ^ Indian and Northern Affairs Canada. "Acts, Agreements & Land Claims > Historic Treaties". Queen's Printer for Canada. Retrieved 17 November 2009. ^ Forsey, Helen (1 October 2010). "As David Johnson Enters Rideau Hall ..." The Monitor. Ottawa: Canadian Centre for Policy Alternatives. Retrieved 23 January 2011. ^ a b c Hall, Anthony J. (1998). "The politics of monarchy: it's not what you might expect". Canadian Forum. Toronto: James Lorimer and Co. (April 1998). Retrieved 9 September 2009. ^ Smith, David E. (1999). The Republican Option in Canada. Toronto, Buffalo, London: University of Toronto Press. p. 16. ISBN 0-8020-4469-7. ^ a b c d Department of Indian and Northern Affairs Canada. "Aboriginal Peoples & Communities > Royal Commission Report on Aboriginal Peoples > Volume 2 - Restructuring the Relationship: Part One: 2.6.1 A Royal Proclamation". Queen's Printer for Canada. Archived from the original on 24 November 2007. Retrieved 28 June 2010. ^ "About AFN > Charter of the Assembly of First Nations". Assembly of First Nations. Archived from the original on 2 August 2009. Retrieved 29 September 2009. ^ a b "About Us > Treaty Principals". Confederacy of Treaty Six First Nations. Archived from the original on 6 July 2011. Retrieved 29 September 2009. ^ Report of the Royal Commission on Aboriginal Peoples (October 1996). "Report of the Royal Commission on Aboriginal Peoples. Volume 2 - Restructuring the Relationship" (PDF). Library and Archives Canada. Department of Indian and Northern Affairs Canada. pp. 16–19. Retrieved 20 July 2017. ^ Her Majesty The Queen in Right of Canada v. Sparrow , 1 S.C.R. 1075 (Supreme Court of Canada 31 May 1990). ^ "Manitoba Metis Federation Inc. v. Canada (Attorney General)". Lexum. Retrieved 5 September 2014. ^ "Manitoba Land Treaty Entitlement" (PDF). Queen's Printer for Manitoba. Archived from the original (PDF) on 5 October 2012. Retrieved 29 September 2009. ^ Office of the Lieutenant Governor of New Brunswick. "Old Government House". Queen's Printer for New Brunswick. Retrieved 4 December 2009. ^ a b Radforth, Ian (March 2003). "Performance, Politics, and Representation: Aboriginal People and the 1860 Royal Tour of Canada". Canadian Historical Review. Toronto: University of Toronto Press. 84 (1): 1–32. doi:10.3138/CHR.84.1.1. ISSN 0008-3755. Archived from the original on 2012-12-17. ^ The Royal Collection. "e-Gallery > Exhibitions > Queen & Commonwealth > Gifts > Walking stick". Queen's Printer. Retrieved 26 July 2009. ^ Department of Canadian Heritage. "Ceremonial and Canadian Symbols Promotion > The Canadian Monarchy > Royal Visit of the Prince of Wales > Are You an "Ace" at Kings and Queens? : A children's quiz on monarchy in Canada". Queen's Printer for Canada. Retrieved 15 April 2007. ^ "Royal Involvement With Canadian Life". Monarchist League of Canada. Archived from the original on 29 October 2008. Retrieved 30 September 2009. ^ Coates, Colin MacMillan (2006). Majesty in Canada: essays on the role of royalty. Toronto: Dundurn Press Ltd. p. 13. ISBN 978-1-55002-586-6. ^ Van Kirk, Sylvia. "The Role of Native Women in the Fur Trade Society of Western Canada, 1670–1830." Frontiers: A Journal of Women Studies (1984): 9–13. ^ Certer, Sarah (22 September 2004). "Your great mother across the salt sea": Prairie First Nations, the British Monarchy and the Vice Regal Connection to 1900". Manitoba History. Winnipeg: Manitoba Historical Society. Autumn/Winter 2004–2005 (48). ISSN 0226-5036. Retrieved 30 September 2009. ^ a b c "Page 1". Christ Church, Her Majesty's Royal Chapel of the Mohawks. Archived from the original on 14 May 2010. Retrieved 1 October 2009. ^ a b "Tyendinaga Mohawk Territory > The Mohawks of the Bay of Quinte". The Mohawks of the Bay of Quinte Research Department. Archived from the original on 11 March 2009. Retrieved 30 September 2009. ^ Alfred, Taiaiakw. "Colonial Stains on Our Existence." In Racism, Colonialism, and Indigeneity, edited by Martin J. Cannon and Lina Sunseri, 3–11. NewYork: Oxford University Press, 2011. ^ Stevenson, Winona. "Colonialism and First Nations Women in Canada." In Racism, Colonialism, and Indigeneity, edited by Martin J. Cannon and Lina Sunseri, 3–11. NewYork: Oxford University Press, 2011. ^ Bourassa, Carrie, Kim McKay-McNabb, and Mary Hampton. "Racism, sexism and colonialism: The impact on the health of Aboriginal women in Canada. "Canadian Woman Studies 24, no. 1 (2004). ^ a b Petrone, Penny (1983). First People, First Voices. Toronto: University of Toronto Press. pp. Ch. 1. ISBN 978-0-8020-6562-9. ^ a b "History". Her Majesty's Royal Chapel of the Mohawks. Archived from the original on 26 March 2009. Retrieved 1 October 2009. ^ Smith, Donald (2001). Semple, Neil, ed. "Nahnebahwequay (1824–1865): "Upright Woman"". Canadian Methodist Historical Society Papers. Toronto. 13: 74–105. ^ Galbraith, William (1989). "Fiftieth Anniversary of the 1939 Royal Visit" (PDF). Canadian Parliamentary Review. Ottawa: Commonwealth Parliamentary Association. 12 (3): 7. Archived from the original (PDF) on 17 November 2009. Retrieved 22 February 2009. ^ Library and Archives Canada. "Biography and People > A Real Companion and Friend > Behind the Diary > Politics, Themes, and Events from King's Life > The Royal Tour of 1939". Queen's Printer for Canada. Archived from the original on 30 October 2009. Retrieved 14 March 2007. ^ Department of National Defence. "Canada Remembers > History > The Second World War > Public Information Sheets > Aboriginal Canadians in the Second World War". Queen's Printer for Canada. Retrieved 6 November 2009. ^ Department of National Defence. "Canada Remembers > History > Other Stories > Native Soldiers > Prince of the Brigade". Queen's Printer for Canada. Retrieved 6 November 2009. ^ "Society > The Monarchy > Coronation of Queen Elizabeth". Canadian Broadcasting Corporation. Retrieved 30 September 2009. ^ a b Tupper, William (1988). "Two Perspectives on the Queen in Canada" (PDF). Canadian Parliamentary Review. Ottawa: Commonwealth Parliamentary Association. 11 (3): 9. Retrieved 14 December 2009. ^ Regina v. Secretary of State for Foreign and Commonwealth Affairs, ex parte Indian Association of Alberta et al. , 118, pp. 127–8 (Judicial Committee of the Privy Council 1982). ^ Department of Indian and Northern Affairs Canada. "Aboriginal Peoples & Communities > Publications > Highlights from the Report of the Royal Commission on Aboriginal Peoples". Queen's Printer for Canada. Retrieved 2 October 2009. ^ "The 'special relationship' of native peoples and the Crown - Canada - CBC News". Cbc.ca. Retrieved 2014-05-09. ^ "Attawapiskat chief won't attend PM meeting in GG's absence - Politics - CBC News". Cbc.ca. Retrieved 2014-05-09. ^ "Queen declines to intervene in Chief Spence's protest - Canada - CBC News". Cbc.ca. 2013-01-17. Retrieved 2014-05-09. ^ "Small meeting without the Governor-General was key for Harper | National Post". News.nationalpost.com. 2013-01-11. Retrieved 2014-05-09. ^ Elliot-Murray-Kynynmound, Gilbert (1 January 1981). Lord Minto's Canadian Papers: A Selection of the Public and Private Papers of the Fourth Earl of Minto 1898–1904. Toronto: The Champlain Society. p. 2. ^ Hubbard, R.H. (1977). Rideau Hall. Montreal and London: McGill-Queen's University Press. p. 15. ISBN 978-0-7735-0310-6. ^ Bousfield, Arthur; Toffoli, Gary (1989). Royal Spring: The Royal Tour of 1939 and the Queen Mother in Canada. Toronto: Dundurn Press. p. 16. ISBN 1-55002-065-X. ^ Office of the Governor General of Canada. "Rideau Hall > Gardens and Grounds". Queen's Printer for Canada. Archived from the original on 17 May 2007. Retrieved 26 February 2009. ^ a b Konkel, Chuck. "Adrienne's story". Star Media Group. Retrieved 3 October 2009. ^ Legislative Assembly of Alberta. "Public information > Lieutenant Governors > The Honourable Ralph G. Steinhauer, 1974–79". Alberta Queen's Printer. Archived from the original on 18 July 2015. Retrieved 3 October 2009. ^ "Steven Point appointed B.C. 's new lieutenant-governor". CanWest MediaWorks Publications Inc. 4 September 2007. Archived from the original on 3 March 2008. Retrieved 3 October 2009. ^ Office of the Prime Minister of Canada (10 September 2009). "Backgrounder: The Honourable Graydon Nicholas". Queen's Printer for Canada. Archived from the original on 13 January 2010. Retrieved 3 October 2009. Nock, David (2006). With good intentions : Euro-Canadian and Aboriginal relations in colonial Canada. University of British Columbia. ISBN 978-0-7748-1138-5.